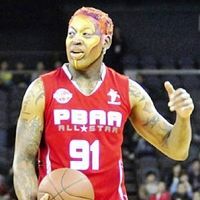 Whether it’s his look or his rebounding, very few things about Dennis Rodman could be called normal. Here are the top instances of his insanity manifesting itself on the court. Before forming one of the greatest Big 3s in the history of basketball with Micheal and Scottie, Rodman played for one of the Bulls’ biggest rivals – Isiah Thomas’ Detroit Pistons. The Worm pushing Scottie into the stands at the 1991 Eeastern Conference Finals shows just how crazy things got between those two teams.